There is no doubt that anyone who collected baseball cards in the late 1980's was very familiar with this card. In fact, I would not hesitate to say that poor Billy Ripken is better known for this card than for his abilities as a baseball player. Seriously. Ask any baseball card collector from that era what's the first thing that comes to their mind when they hear the name Billy Ripken, and I guarantee you'll get one of two responses. Either they'll smile and offer a tame reply or they'll come right out and say it -- "F*CK FACE." As a young baseball card collector in 1989, this was one of the most coveted cards out there -- the 1989 Fleer #616. Not because Billy Ripken was an outstanding player. 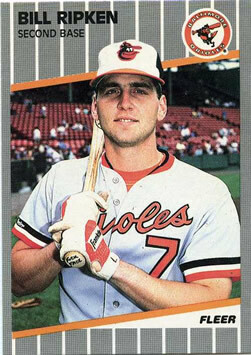 Not because he was the younger brother of hall-of-famer Cal Ripken. This card was a must-have because ol' Billy was holding a bat that someone had taken a magic marker to and decorated with a phrase that would widen the eyes of any 12-year-old. Back in the day, this card was next to impossible to find. These days, thanks to the wonders of eBay, a person looking for #616 can find it for five or ten bucks plus shipping. Needless to say this card has found its way into my collection as well as that of my older brother. 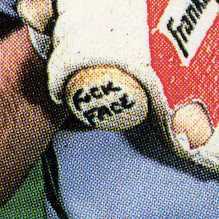 For more on Billy Ripken and his dirty bat, check out the article on Snopes.com as well as the fairly entertaining BillRipken.com.